played on Saturday, 9 August, 2003 at 3p.m. Alty drew 2-2 with Blackburn in the corresponding fixture last summer. The Robins came into this game unbeaten after nine pre-season games. The fixture was played on the hottest day of the year when street thermometers in Altrincham were registering 38 degrees. It was good to hear the main stand tannoy back in action after it had been put out of action by squirrels ganwing through the cables! Many thanks are due to Youth team coach Neil Thomason for scaling the ladder to make the repair. Thanks were also due to Peter Barry, the groundsman, whose pitch was again in excellent condition. 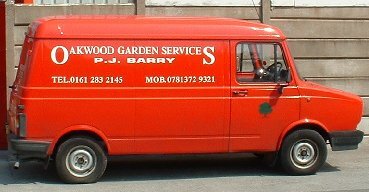 Right: Peter Barry's van outside Moss Lane today. Alty rested Chris Adams and Mark Maddox from their regular starting line-up, but Maddox was on the bench. Rod Thornley was back from his tour with Manchester United and Mattie Hughes was also back to partner Rod at the Alty front end. Gary Scott and Paul Robertson were both back, after injury, whilst Gary Talbot was available once again to start at centre-back with Stephen Rose. Blackburn included several players with first-team experience; these included Italian striker Corado Grabbi and Irish international Alan Mahon. The visitors' directors' box was filled with famous names - manager Graeme Souness, striker Andy Cole, as well as Lorenzo Amaruso and Dean Saunders. ALTRINCHAM (Red & white striped shirts, black shorts, red socks): 1. Richard ACTON, 2. Gary SCOTT, 3. Barry SHUTTLEWORTH, 4. Stephen ROSE, 5. Gary TALBOT, 6. Steve ASPINALL, 7. Rob MATTHEWS, 8. Ian CRANEY, 9. Mattie HUGHES, 10. Rod THORNLEY (capt.) 11. Paul ROBERTSON. Subs: 12. Dave GARDNER, 14. Peter BAND, 15. Mark MADDOX (capt. ), 16. JASON GALLAGHER, 17, Neil RYAN, 4* Andy TUNNICLIFFE, 8* Steve LUNT. BLACKBURN ROVERS XI (Blue and white halved shirts, white shorts and socks): 1. D. YELLDELL, 2. C. DONNELLY, 3. A. TAYLOR, 4. I. BLACK, 5. J. FITZGERALD, 6. G. GREER, 7. Jerome WATT, 8. G. HARKINS, 9. Corado GRABBI, 10. Alan MAHON (capt. ), 11. Alan MORGAN. Subs: 12. A. NELSON, 13. K. RENTON (gk), 14. Alex BRUCE, 15. J. JOHNSON, 16. A. TARRICK SAKALL. A minute's silence was held for Paul Clitheroe, a longstanding Altrincham supporter, and former Blackburn Rover, Ray Hartford, who died today of cancer. There was also a half-time collection for Steven Commey, a 14 year-old Northern Moor schoolboy and captain of the Altrincham Juniors U-14 side, who was killed recently by a discus whilst having a school sports lesson. Steven's team mates were at the match as was a party of Manchester United youngsters. Blackburn kicked off in the sweltering heat and almost took the lead in the opening minute. Harkins turned past Rose on the Rovers' left and his cross allowed Grabbi a close range volley which the Italian striker put miles over the bar. Blackburn continued to press in the opening stages but a quickly taken throw-in by an alert Thornley set Hughes towards goal but the ball ran on to the keeper (4 mins). Mysteriously the corner flags, which had been missing for the opening seven minutes of the game, were put in their appropriate slots. Robertson made a couple of good early interceptions but it was clear that Blackburn had sent a good side which would give Altrincham a thorough workout. Rose, Robertson and Matthews fed Hughes for a bicycle kick shot but he was penalised inside the Rovers' box (13 mins). The first corner from the left came after 15 minutes, to Blackburn and this led to a second, on the right, off Shuttleworth. Manager Graham Heathcote shouted instructions to his defence but these proved to be of no avail as the Rovers took a short corner from Mahon to Watt, who returned the ball to Mahon as he moved infield just outside the penalty area. As the defence stood off, Mahon drove a fine, low shot past Acton to open the scoring (16 mins). A drinks break immediately followed. Though Alty were on the back foot, Craney won the ball well twice in as many minutes but the home side's best effort was a 30-yarder over the bar from Aspinall. In the Alty defence Gary Talbot was winning more than his fair share of aerial balls as the Robins began to get into the game. Mattie Hughes then seized on a poor clearance and rounded the keeper, only for a defender to clear his shot off the line (31 mins). Then a fine tackle from Scott set Thornley racing forwards but he was given offside. Alty then equalised when Yelldell got his feet in a tangle trying to clear a back pass just to the left of his net near the goal-line. The ever-alert Thornley harried him and rolled the ball into the net from an acute angle - it was too hot for one of Rod's customary cartwheel celebrations (35 mins). Another drinks break followed for the players and officials on an afternoon when even sitting watching the match from the shade of the stand was hot work. A mistake by Scott gave Blackburn a corner on their left which was cleared at the foot of the Alty post by Ian Craney as Graham Heathcote made his feelings clear to his defence (38 mins). The respite was short as Grabbi, on the left, fed Morgan who netted the visitors' second goal (38 mins). Blackburn won another corner (41 mins) which was cleared but then a foul by Harkins on Robertson gave Alty a free-kick. Following this, Hughes stooped to head a cross into the box and was caught on the nose by a Blackburn boot. After lengthy treatment he left the pitch with a bloodied nose and was replaced by Peter Band at what appeared to be a minute before the interval. However, the referee allowed generous time for the injuries and for the drinks' breaks and after 50 minutes of elapsed time, Blackburn won a corner. This was cleared but then, in the 52nd minute, Donnelly, Grabbi and Mahon put together a slick move from which Mahon lobbed Acton from the left sector of the penalty area to make it 3-1. Had Alty been able to hold on for 20 seconds more they would have reached the interval just a goal behind. Half-time witnessed a presentation by Mark Eckersall, joint chairman of SAFE, the Altrincham supporters' association, of a cheque for almost £1,500 which represented the club's payment to The Conference for inclusion next season in either the Conference itself or its new feeder division, Conference North. 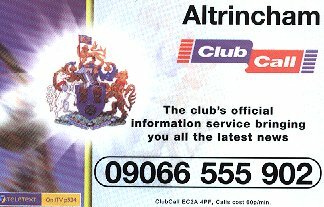 SAFE voted before the game to disband itself after raising over £53,000 since 1995 for the club, as there is now a supporters' trust, STAR, to represent the interests of Altrincham fans. Alty brought on Gardner and Maddox at half-time to replace Robertson and Matthews, as Ian Craney now partnered Thornley up front following Hughes's departure. Blackburn introduced Nelson at the interval. Alty got off to a bad start when with barely a minute gone, Grabbi received a long cross on the left and found Watt inside him with a header and he beat Acton coolly (47 mins). Any hopes of retrieving the game now seemed to be slight with the score at 1-4. It could have been worse when Watt, Grabbi and Donnelly combined well for the impressive no.2 to shoot firmly at goal only for Acton to produce a fine save to tip the ball out for a corner (49 mins). Though Acton dropped the corner, the ball was cleared. An error by Scott then let in Nelson who fed Grabbi but the Italian's firm shot went just over the bar (52 mins). Alty were under pressure till Thornley got in a shot, wide of the target and though the home side were now improving, Acton had to save a shot from Watt just before Grabbi left the field to be replaced by Johnson (60 mins). Alty now brought on Ryan and Gallagher for Rose and Craney (63 mins) and Gardner and Thornley now led the line. Tarrick came on for Watt (66 mins) and soon won a corner off Greer. This was cleared but Band soon got in a shot at Yelldell after an error by Greer (70 mins). Gallagher then charged down Morgan's attempted pass near half way and charged towards goal on the right wing but his shot was wide (71 mins). Another drink stop was called by the referee. From the restart an excellent long ball forward from Maddox, whose passing accuracy often goes unnoticed set Thornley running at goal. Rod lobbed the keeper expertly from left of goal to make it 2-4 (72 mins). Immediately Tunnicliffe replaced Shuttleworth whilst Lunt and the returning Rose replaced Scott and Thornley. Blackburn's Tarrick, Donnelly and Harkins put together a fine move which led to a shot from Donnelly which Acton beat out well to concede a corner on the right. Despite this Alty were now playing well and won a corner of their own when Lunt flicked the ball on for Tunnicliffe, left of goal. (79 mins). After attempts by Gallagher and Talbot, Rovers got the ball clear. On the break the dangerous Donnelly forced a point-blank save from Acton (80 mins). Alty continued to press however and had they been able to get the score to 3-4 who knows what might have happened. However, after the Alty defence had backed off Blackburn won a corner on the right. This was poorly taken by Tarrick and landed comfortably in Acton's arms in the centre of the goal with no opposition player immediately near him. Inexplicably, the ball spilled out of the Alty keeper's grasp and dropped behind him into the net for a soft fifth goal to Blackburn (88 mins). Though Blackburn well merited their win, at least a couple of the goals were due to defensive lapses which will have disappointed the Alty team and management. It was heartening, however, to see that heads did not drop after the two goals which straddled half-time and that in the middle of the second half it looked distinctly possible that Alty might get back into the match with a third goal. With temperatures on the pitch exceeding 100 degrees, the fitness of both sides was clear to see. To have suffered just this one defeat in ten pre-season games gives Altrincham fans heart for the new season and though Mattie Hughes left the changing rooms with both nostrils plugging his bloodied nose, it is understood that the injury is not too serious. As Mattie is suspended for next Saturday's game, hopefully he has time to recover fully for the match on 19 August.